a photograph taken by Frank Hurley, part of Ernest Shackleton's ill-fated expedition to Antarctica in 1913. The ship got stuck in the ice on the Weddell sea and was ultimately abandoned. 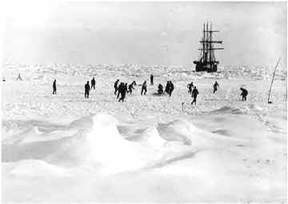 The photograph is of a game of football played on the sea ice.